The long awaited automation of the sub-surface lines began today with the implementation of the Hammersmith to Latimer Road CBTC section. After a full days work testing yesterday it was decided the scheme should be implemented with effect from Sunday. Hammersmith signal box was used for the last time early Saturday morning and the engineers were not expecting it to be used again, unless there was some reason that the CBTC just could not be used this weekend. Clearly their plan was this weekend would be the one the CBTC was successfully implemented. Following the successful tests the engineers moved in to ensure the signals were all reset to red and the covered in that nice strong black plastic which is such a feature of the underground’s redundant signalling. 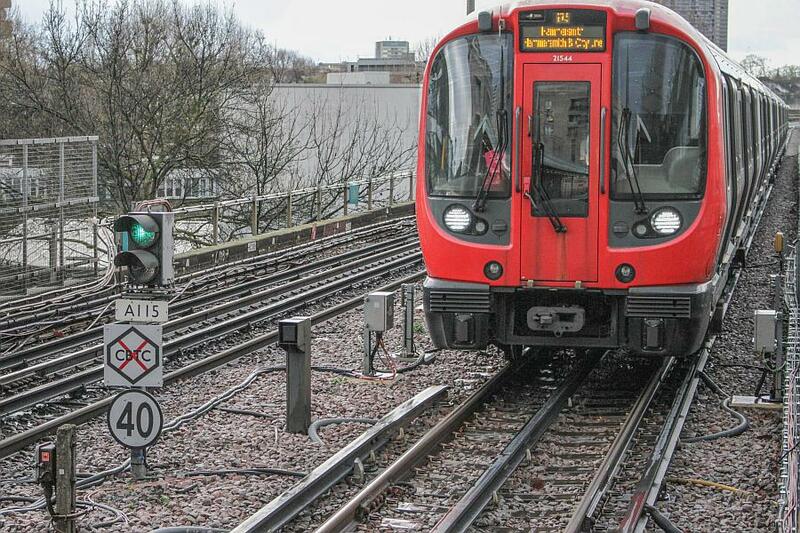 The signalling will be kept for a minimum of six months in case a roll back is ever needed, although in practice (such as on the Northern Line) the signals have been kept under wraps ever since CBTC began quite a few years back! The controller at Latimer Road ensures train staff are allocated to the correct trains en route to Hammersmith. One of these was to ensure staff were adept at switching their trains into manual, and in fact as I was advised, some trains were being driven in manual on part of the line as part of a recap for train staff. Much of this was done in the direction from Latimer Road to Hammermsith and most train staff rode the cushions back to Latimer Road to begin the cycle of cognizance once again. TfL could have put the system straight to work on the Monday morning, however their reason for wanting to make it live on a Sunday afternoon was obviously to ensure they had a period of real world operation rather than begin the CBTC operation on a Monday morning when systems would be more critical and the rush hours meaning anything could go wrong. 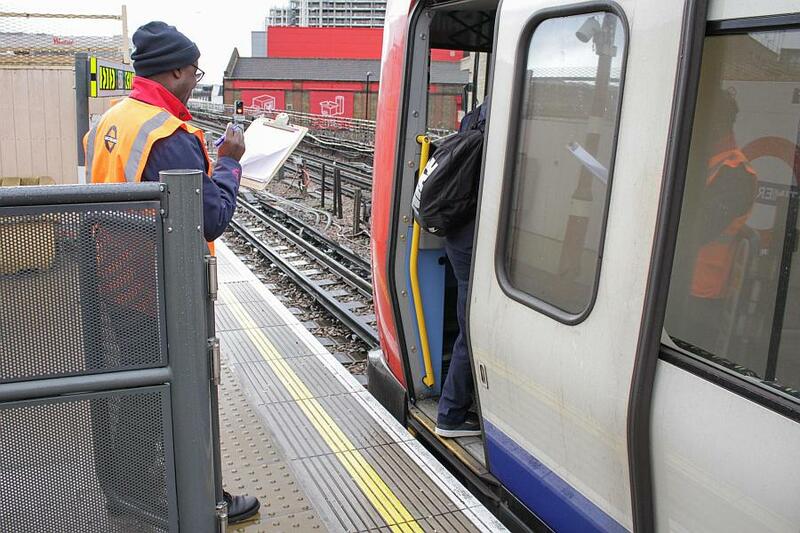 The temporary line controller at Latimer Road marking off his rota sheets as staff board their allocated trains. Note that signal HMS001 is showing a red. 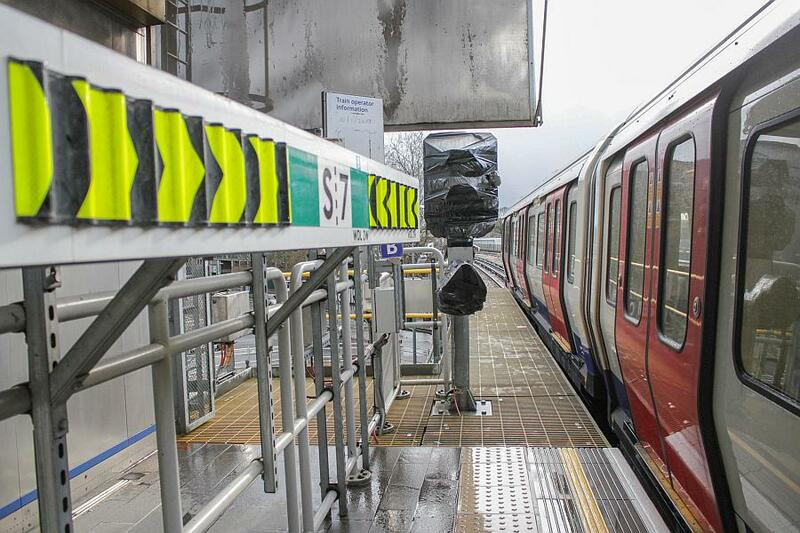 The sub surface lines’ CBTC use the new wi-fi access points located at regular intervals along the lines (for in cab signalling and instructing the trains’ computers whilst track bailises which enable the trains to know their location. I had been aware for some time that this weekend was a critical one in terms of the sub-surface lines CBTC and had understood if the tests were successful this time the line between Edgware Road and Hammersmith would open earlier than planned. TfL’s advice was that it was to be closed the entire weekend, but it was in fact re-opened at 2pm for public services. 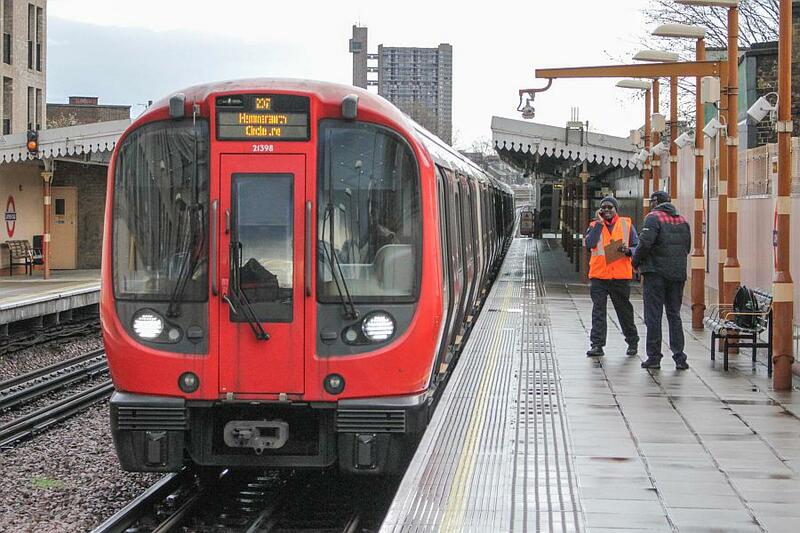 The CBTC first train to be operated in public from Hammersmith was the 14.06 Circle Line. 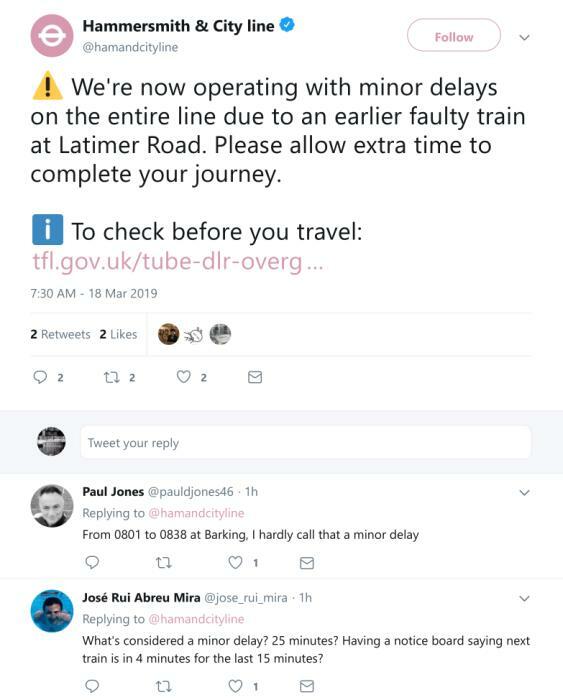 As I understand it the first westbound train to go public was at 2pm from Edgware Road which meant it entered CBTC operation about 14.10pm at Latimer Road. I was made aware just after 14.20pm that the new system had become live and the first sub-surface trains were now running on CBTC! Thus I dashed into action, grabbed my camera, caught a bus and then the tube on to Latimer Road. The system took a little while to kick in at Latimer Road even though the signal showed a blue aspect. According to lineside notices staff were instructed to ensure the CBTC was active whilst their train stood at ladbroke Grove. I think the delay was due to the system establishing the train was in fact at Latimer Road station and then implementing the interfaces and sending instructions to the trains’ computers before the train operator could actually initiate it. One definite thing that marked the occasion was the inclement weather. The sun was shining just as I set out and without a doubt I was the first to photograph the new system in operation. Nevertheless there was hail, gales, and torrential rain – I had no waterproofs and simply counted on the fact most of the platforms en route were well and suitably covered! And its funny that most other enthusiasts arrived after the skies had cleared and the weather calmed considerably! Signal HMS 001 (Hammersmith Signalling Centre’s lowest numbered signal apparently) gives the all clear for the train to continue in CBTC mode to Hammersmith. Latimer Road with our lineside controller, who was kept very busy the entire afternoon ensuring the transition to CBTC remained in good stealth and that the train services ran effectively. Note the platform repeater signal on the eastbound platform. This is now the first active signal on the eastbound line. That on the westbound has been decommissioned. 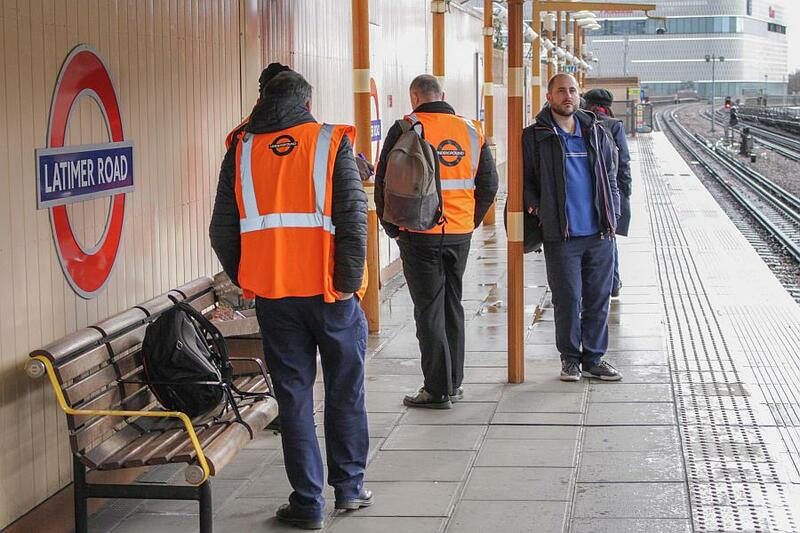 Train staff at Latimer Road awaiting their allocated trains. Signal A115 at Latimer Road is now the first active station starter signal on the eastbound line. The sign below clearly denotes the end of the CBTC section. Decomissioned signal at Wood Lane. They’re all wrapped in the cheerful ‘back bin bag’ material that forms a feature on every single one of London Underground CBTC lines! The CBTC is responsible for opening the train doors and there was a rather long delay before the system decided the doors were ready to be opened. This was probably five to ten seconds. Its not long but it adds up. It is said the CBTC allows the trains to run a bit faster so this significant delay to the doors is not really a problem at the moment because the trains are still running on the old timetables. However this delay will be a problem if it remains once they have tightened up the train times and introduced new timetables. Decommissioned signal and gap indicator at Shepherd’s Bush Market. More decommissioned signals this one is at Goldhawk Road. 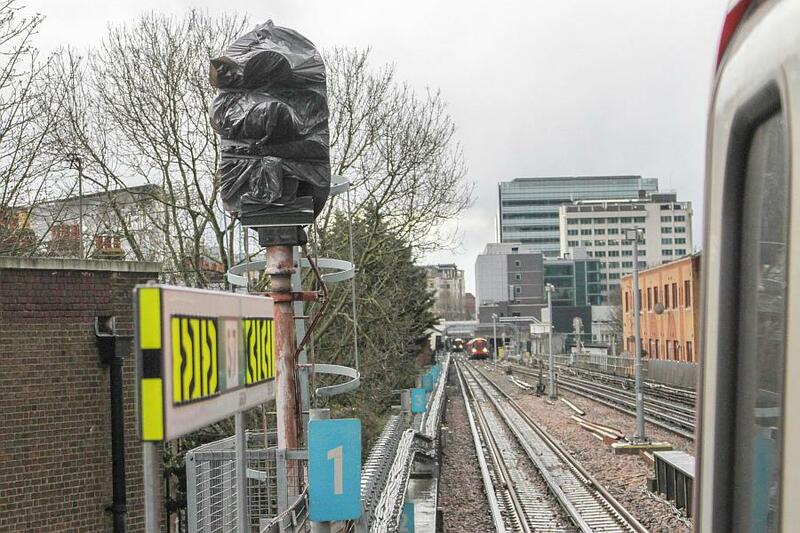 The ‘wi fi’ masts for the CBTC can be seen running down the middle of the trackbed towards Hammersmith. I have covered these (and the 4LM) before here. Hammersmith station with a train ready to depart. 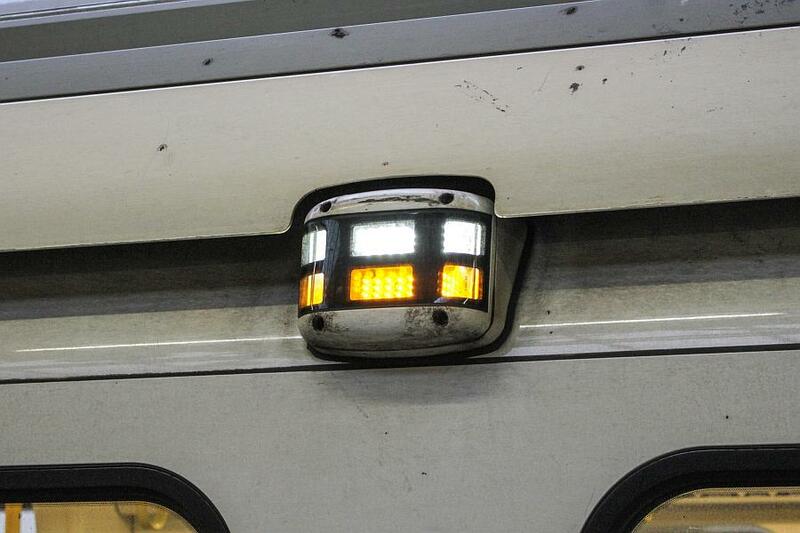 Every carriage has a CBTC light which comes on when the train is about to depart. The CBTC light on the S 7 stock. 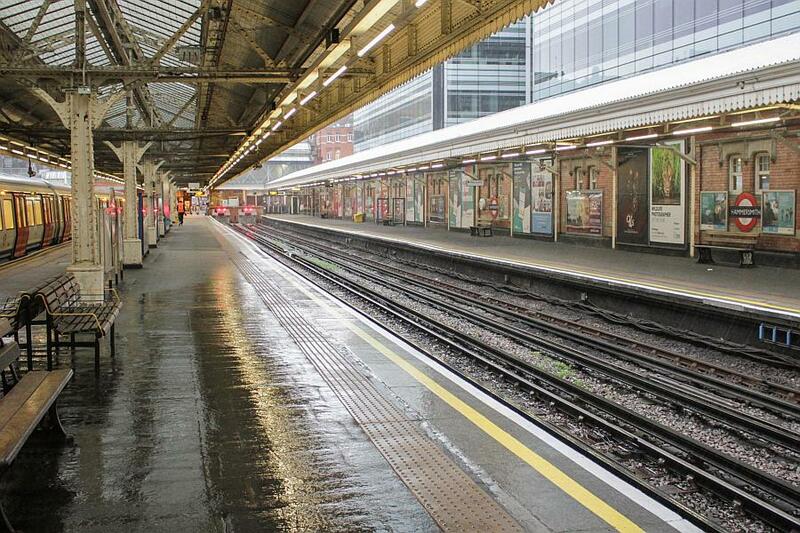 A practically deserted Hammersmith station after a lengthy spell of gales, torrential rain and hail! I had to wait inside the train on the left whilst the weather did its worst. It was extremely windy and it was nearly impossible to stand up! I actually tried to take photographs of one of the train staff battling through the elements to their train but gave up! An enthusiast chatting with one the TfL staff involved in the CTBC project. 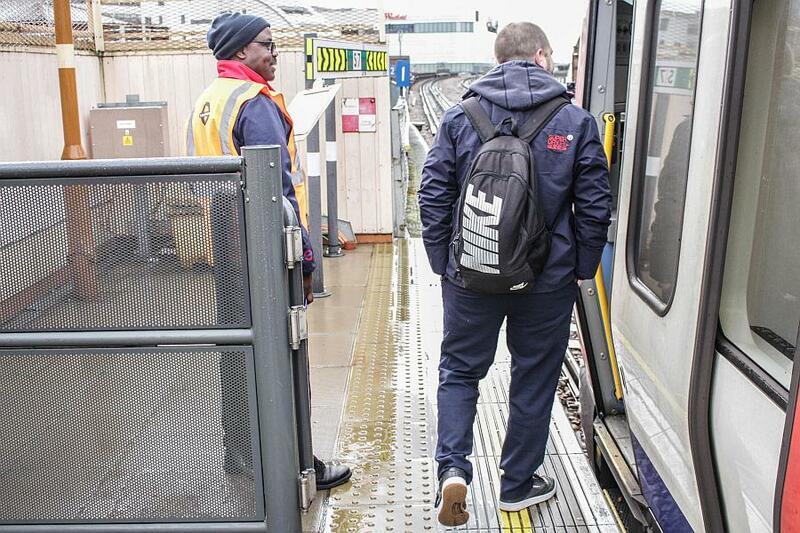 Our TfL guy was on his way to Latimer Road to give the line controller a hand and also ensure train staff were well versed in the use of the CBTC. Remember training situations and real world situations often differ which is why senior staff were out and about making sure it was all going well. 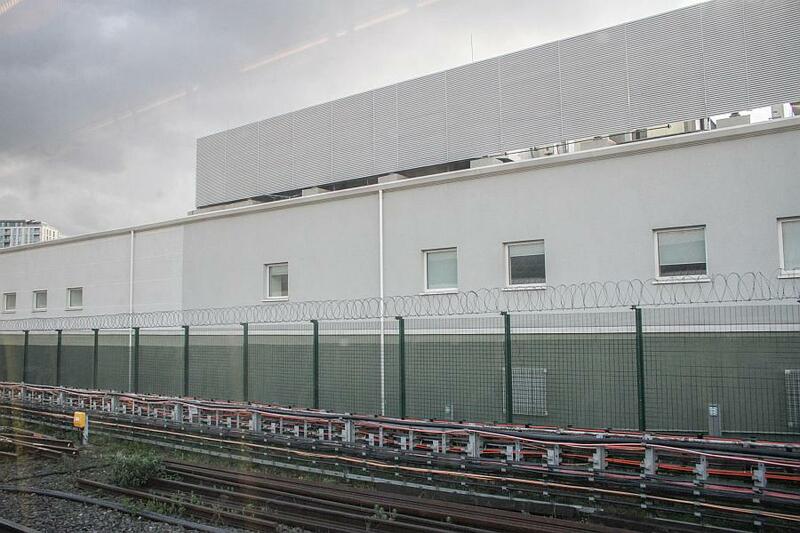 This picture was taken about two hours after the first CBTC trains had begun. 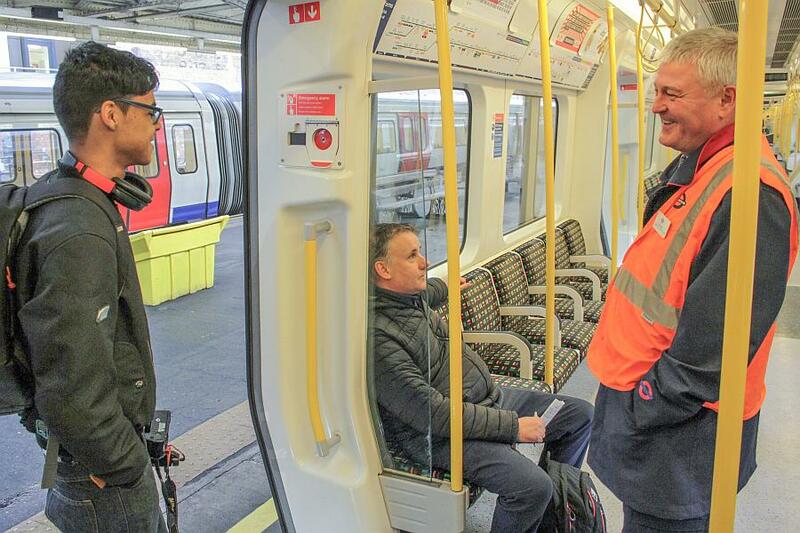 We had a discussion (me and the TfL instructor) about the trains operation on CBTC. I could detect they had a slight problem drawing into some of the stations, they were hunting for the trackside beacons and giving an uneven ride, it probably wasn’t noticeable to most because it was very subtle however I discerned it and was pointing out the instants when the trains did that. He agreed there was some hunting of the beacons and this meant some fine tuning would be necessary. He also confirmed to me the next CBTC section from Latimer Road to Paddington (and on to Baker Street) was still planned to go live in July this year. 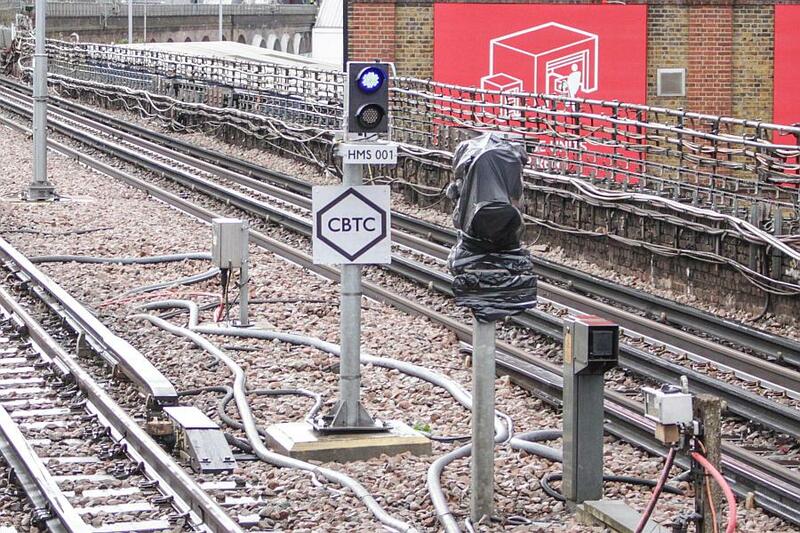 No doubt the staff working at the new Hammersmith Signalling Centre are pleased the CBTC system has at last gone live! Niggling problems this morning as a train threw a wobbly at Latimer Road. Assume it was issues with the train’s interface with the CBTC. 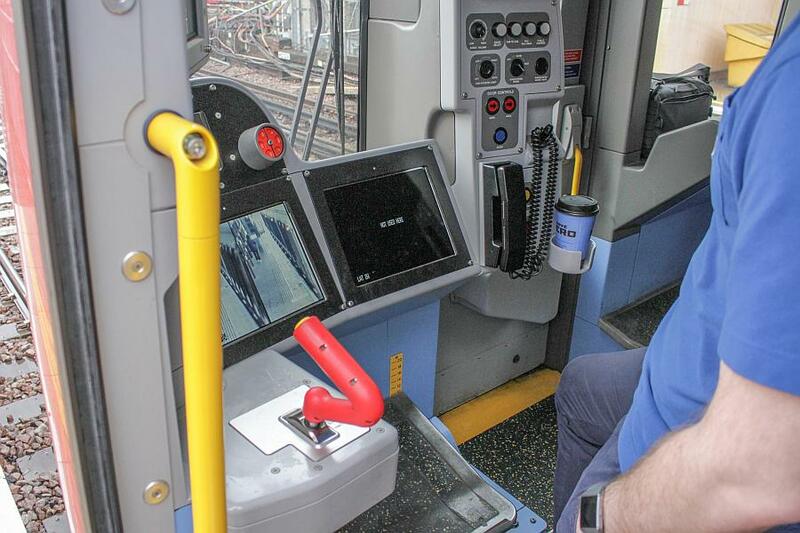 Despite the TfL staff telling me all train operators were being made sure they could drive their trains in manual (its called coded manual) in real world terms – maybe this one train couldn’t even interface with the system sufficiently to allow coded manual to be undertaken? As for the Sunday itself, when the CBTC became live, one other thing which so far even the TfL guy couldn’t give an explanation (I think he had just come onto duty when I met him) was Hammersmith sidings was absolutely crammed full with S7 stock when I arrived. All these trains were just being re-marshalled then put into service (they were being sent straight out and going into service at Goldhawk Road.) It was absolutely pouring with rain and the wind was terrible thus I only took a couple of pictures. This indicates to me the testing period had indeed been done with fewer trains than is normal in the timetable (they were sending the Circle Line round in a proper circle so perhaps the requirement was fewer trains until the CBTC went live.) 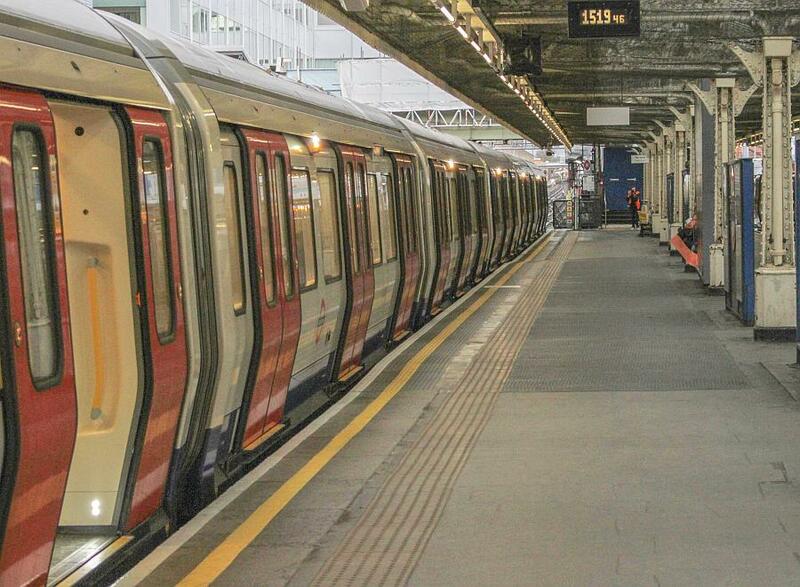 In the short space of about twenty minutes Hammersmith depot was absolutely empty – even for a Sunday! Another thing I noticed is a number of staff were unsure of their correct trains at Hammersmith. Its not new I see it happen here sometimes – however it seemed as if there was more confusion. I don’t think the weather was helping and staff were having to struggle with the elements. At least one staff came straight onto pm duty and had to take their very first CBTC trains out of Hammersmith on their own without any supervision and I think this was slightly disconcerting for them, despite the training they have had – especially as all the supervision was being done in the other direction from Latimer Road. This was during the awful weather when no-one seemed to dare venture outside. I mean even I had to take refuge in the trains themselves because the wind blew the rain and hail right across the platforms at Hammersmith. Otherwise all the other trains I observed had an observer in the cab as far as Latimer Road. A must for reading. 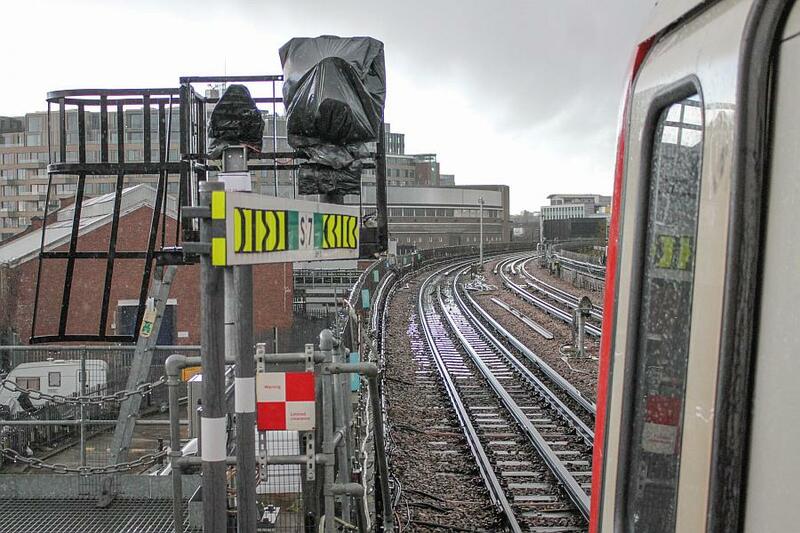 I recommend this excellent and detailed article (published 15th March 2019) on the 4LM/CBTC, Hammersmith signal box (and other still working signalboxes) by Moretojack who has worked for a number of years as a signaller at both Hammersmith and Edgware Road. Previous Post: Geoff’s least used tube stations? Next Post: The Vessel opens – and that elevator! FYI – the fixed base stations in Wi-Fi systems are called “Access Points” (AP’s) or “Wi-Fi Access Points” (WAP’s) not “routers.” In the field of data networking, a “router” and an “AP” are very different “things.” The “get-you-on-the-Internet” box you have at home contains both. Thanks – have corrected that!